Roman history in Latin readings sustained by English prefaces and generous annotation, Aeneas to Augustus is paper-bound and lithographed from typescript while practice tests its effectiveness. Prose (Part I) and poetry (Part II)--each Part a term's work with a full historic span--may be alternated during a year's course without losing continuity. Latin readings approximate a class hour's needs; each Part forms a sequence of graduated complexity; a vocabulary is included; and literary and linguistic annotations will interest both beginning and advanced students. World-State in Greek and Roman Political Theory until Augustus and The Antonine Monarchy. 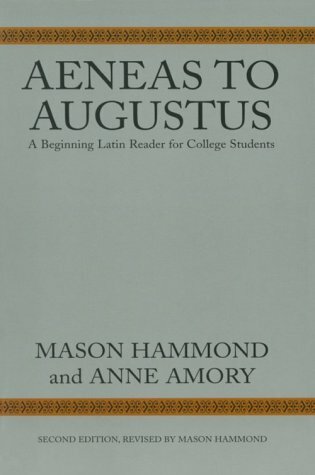 Also the co-author of Aeneas to Augustus: A Beginning Latin Reader for College Students and co-editor of revised editions of Plautus's Menaechmi and Miles Gloriosus, Hammond is an American Academy of Arts and Sciences Fellow. Gaii Gracchi tribunatus et exitus Velleius. 180 words. Ciceronis de Gracchis sentential Cicero. 165 words. Sallustii de Gracchis sentential Sallust. 8 words.